The Reasoning Through Language Arts test expects you to be able to extract and analyze information from data, graphs, and pictures. This analysis involves making deductions or inferences from these sources. (A deduction is a logical conclusion that follows from a given set of data. An inference is a generalization that describes a set of data.) Numerical data is often presented in a table, followed by a question that challenges your ability to extract or interpret data presented in the table. Credit: Info used in table from U.S. Census Bureau, Population Projections, 2014, table 1. Data to be analyzed presented in a table. What is the projected population of the United States for 2020? Reading the table isn’t as easy as it first appears. Choice (A) is tempting. If you go to the Year column and find 2020 and then follow it across to the number in the Population column, you get 334,503. Unfortunately, the fine print near the top of the table indicates that the population numbers, including Natural Increase, Vital Events, and Net International Migration, represent thousands, so 334,503 actually represents 334,503,000, which is answer Choice (B), the correct answer. Choices (C) and (D) are also wrong; the data has been selected from the wrong line or missed a significant detail. How does the source of population growth change between 2015 and 2025? (A) The number of deaths declines. (B) Net international migration is a larger source than natural increase. (D) Births are the largest single source of population growth. The table projects that the population of the U.S. will increase between 2015 and 2025. Two elements that make up population growth: natural increase and net international migration. Natural increase is the population increase that comes as a result of the existing population producing more births than deaths. If you subtract births from deaths in any given year, you see that the result is the number in the natural increase column. The table shows deaths increasing, so Choice (A) is wrong. It’s also wrong because it doesn’t answer the question; if deaths increase, they can’t possibly be a source of population growth. Choice (C) is true, but again, because natural increase declines, it can’t be a source of population growth. Choice (D) is wrong because births aren’t the same as natural increase. Births contribute to population growth only to the degree in which they exceed deaths and result in a natural increase. The correct answer is Choice (B): Natural increase (net births minus deaths) is declining while net international migration is increasing. Information is also presented visually, in the form of graphs. Graphs allow the reader to see trends more easily than when data is presented numerically, especially when comparing several items. Data to be analyzed presented in a graph. How has the number of phones imported from China changed in the years 2007 to 2014? The graph shows several trends. The first is that imports of cellular phones climbed steadily from 2007 to 2011, declined slightly in 2012, rose again in 2013, and dropped in 2014. It shows a steady increase in imports from China from 2007 to 2013 and then a slight decline in 2014. Determining China’s proportion of the trade requires more interpretation. 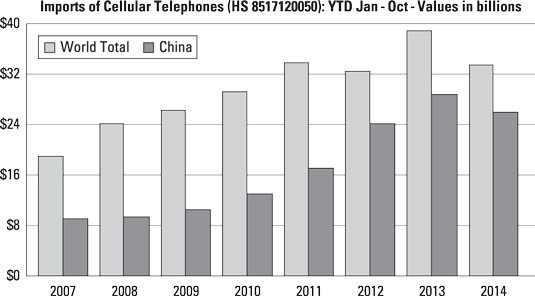 In the year 2008, imports of cellular telephones amounted to about $24 billion. Of that, about $9 billion was from China. China’s proportion of the imports was 9/24, or 37.5 percent of the total. By 2014, the total imports amounted to about $34 billion. China was the source of about $26 billion of that total. China’s proportion of the trade was 26/34, or 76.5 percent of the total. A few more calculations would better reflect the changes over time, but even this limited view shows a trend, making Choice (D) incorrect. The correct answer is Choice (A). China’s proportion of the trade hasn’t declined, so Choice (B) is wrong. A change has occurred, so Choice (C) doesn’t work. The GED test may also present illustrations or photographs that convey information and challenge you to extract that information from the graphic. A picture is worth a thousand words. That may not literally be true, but pictures certainly add to informational text by providing a great deal of information that can be used as evidence to support arguments. 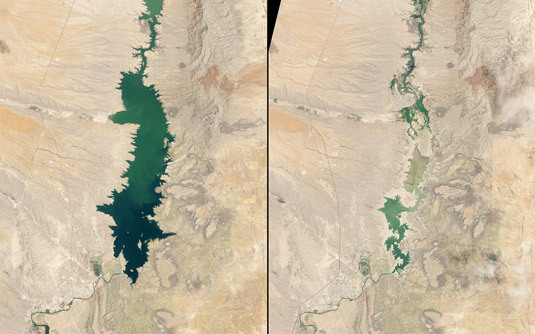 These photographs are of the Elephant Butte Reservoir in New Mexico. The image on the left is from June 2, 1994, and the image on the right is from July 8, 2013. The dark area is the lake. The color of the water also is an indicator of the depth; the darker the color, the deeper the water. The GED test challenges you to obtain information from images. What conclusion does this set of images support? (A) Satellite images provide excellent overviews of landscape. (B) Relying on reservoirs for water is a bad idea. (C) The reservoir has failed. (D) Local agriculture that depends on irrigation is at risk. The image clearly shows the reduction in the size of the reservoir. Choice (A) is correct but misses the key point. You could certainly conclude Choice (B) is correct, based on the photograph, but it isn’t the best choice because it overgeneralizes, drawing a broad conclusion from a single instance. Choice (C) is possible, but nothing in the photos supports it; nothing suggests that the structures creating this reservoir failed. The best answer is an extrapolation, a deduction based on the size of the reservoir. Farmers who depend on this reservoir for irrigation water are in trouble, and Choice (D) is the answer you’re after.